Despite digital’s dominance of the audio world, there has been a slow and steady resurgence of analogue technology – more specifically, of the vinyl record and the turntables required to play them. Let’s not fool ourselves: vinyl record sales are still miniscule compared to the demand for CDs, and the increasing popularity of digital music downloads. And then there’s also the fast-growing trend favouring music streaming services to consider. Even so, vinyl sales are on the rise globally. As a result, record pressing plants are being reopened, vintage recordings are being remastered and reissued, and new turntables, tonearms and phono cartridges are being released. So much for the predictions that the compact disc would sound a death knell for the LP record. Yes, vinyl is no longer the mass-market music medium it once was, but despite its obvious technical shortcomings, its sonic appeal has been firmly re-established. Against that backdrop, it should come as no surprise that the demand for turntables has increased significantly. We’re not just talking mass-market, cheap-and-nasty brands here, but high-end disc spinners, too – and with new materials and tech available, they’re better than ever. A trained furniture designer, Capetonian Lance Dixon has more than three decades of experience in design, manufacture and engineering across a spectrum of disciplines. He also happens to be a music lover and an audio enthusiast, and is the Mother City’s representative for several local audio component manufacturers, including Valve Audio and Sonor Audio. 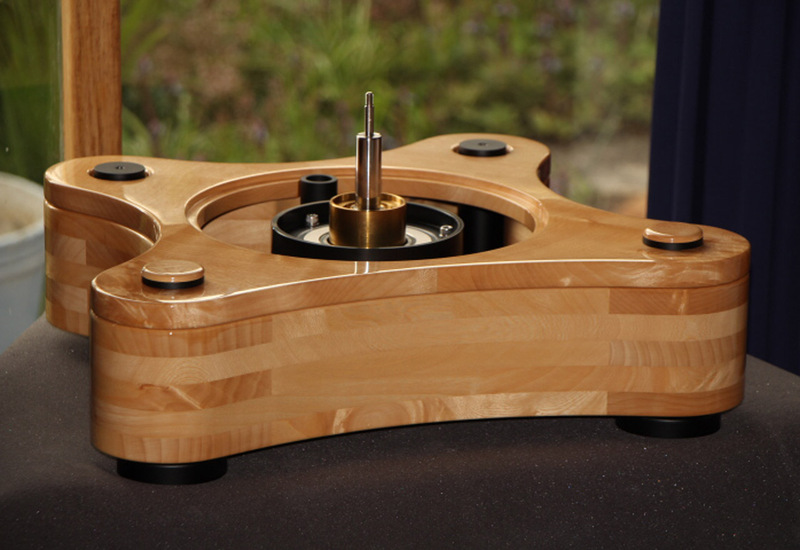 That unique combination of talents and interests would stand Dixon in good stead when he decided to embark on designing and building his own high-end turntable. Little did he know how arduous and challenging that journey would be! 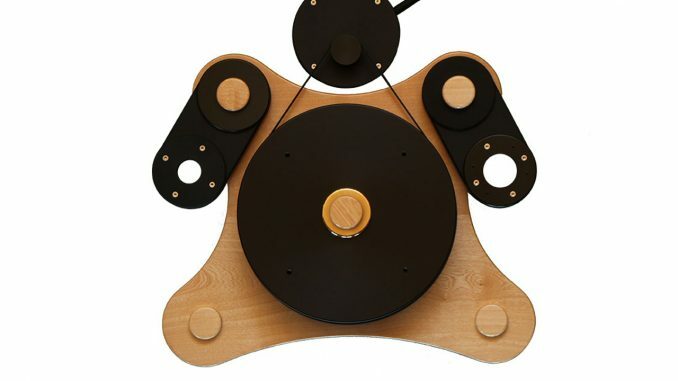 That was back in 2013, and the idea was to create a world-class turntable that would compare favourably with commercially available high-end record decks. But what started out as a hobbyist project soon became an obsession, while reflecting Dixon’s considerable capabilities as far as design, craftsmanship, manufacturing and engineering are concerned. It took four years to create the prototype, now dubbed the Revolve. I first heard it at Audio Exchange in Johannesburg’s West Rand towards the end of last year, and it has subsequently spent the best part of six months in the Audio Video listening room. As the accompanying images show, the Revolve is a substantial piece of kit that certainly looks the esoteric, world-beating part. Despite its prototype status, the build quality is immaculate and attention to detail impressive. Perhaps more importantly, the level of engineering employed not only reflects considerable prowess, but a close understanding of what sets great turntables apart from merely competent designs. Space constraints prevent a full description of the Revolve’s design and development odyssey, but fortunately Dixon has documented the process on his own Sounds Natural website, and I’d urge you to visit it here for more technical detail and insight. The Revolve is a substantial record deck with an unusual, curved profile that is both distinctive and aesthetically pleasing. The 35kg hardwood plinth consists of five laminated layers of jacaranda, although customers will be able to specify any suitable hardwood. The plinth is suspended from a trio of foot assembly pillars containing extended spikes that locate in brass feet with silicon pads. The front assemblies are height adjustable. A separate motor pod is centrally positioned behind the plinth. The heavy steel pod houses a high-precision, Swiss-made Maxon 24V DC motor, chosen for its accuracy, stability and non-cogging characteristics. The motor turns the platter via a dual-belt pulley system featuring a 55:1 reduction gear. 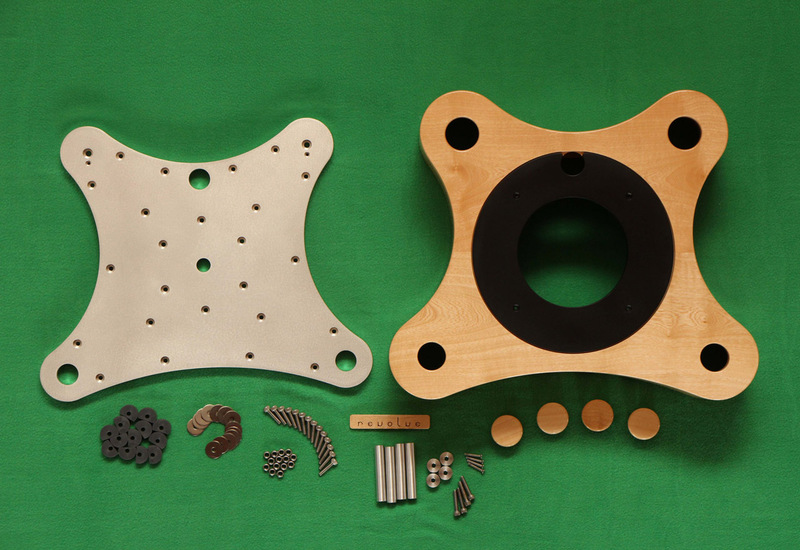 The platter itself is arguably the most complex part of the Revolve, and consists of spectrum of materials aimed at ensuring inertness and countering resonance, while also allowing for stability and consistent rotation speed. I’ll discuss it in more detail in the ‘Under The Covers’ section, but consider this: the platter weighs around 17,5kg, and uses a combination of steel, brass, aluminium and Delrin. The anodised aluminium armboards are mounted on either side of the platter. For this review, the left armboard was unoccupied, while the right armboard was fitted with a Graham Phantom II tonearm. The Graham provided a welcoming home to a Van Den Hul Colibri moving coil cartridge. The third component of the Revolve record deck system is the control unit, which is accommodated in a separate, slim enclosure with a front fascia that mirrors the curved profile of the plinth, and has the same, matching laminated wood finish. It includes rotary controllers for start/stop and speed selection, together with a power on/off button linked to a blue LED indicator. A USB socket allows the unit to be linked to a computer for unit-specific speed programming purposes. As already mentioned, the very detailed description on Dixon’s Sounds Natural website provides comprehensive information on the technical aspects of the Revolve’s design – and the level of thought and attention that’s been sunk into the turntable. 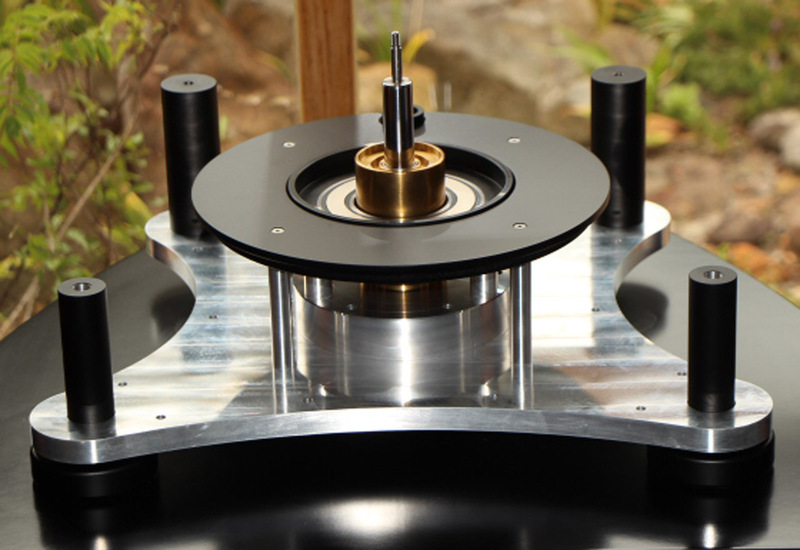 It’s clear that Lance carefully considered every aspect of the turntable with the aim of ensuring that each element meets the highest possible standard. The platter is perhaps the best illustration of this. It consists of no less than four main components: the central boss, a lower platter, a centre platter, and an upper platter. 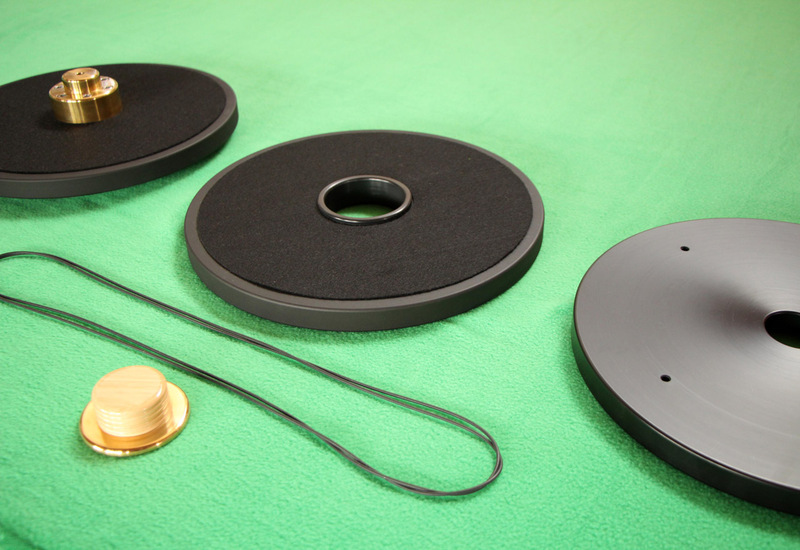 The three platter discs are separated by intermediate layers of isolating felt. 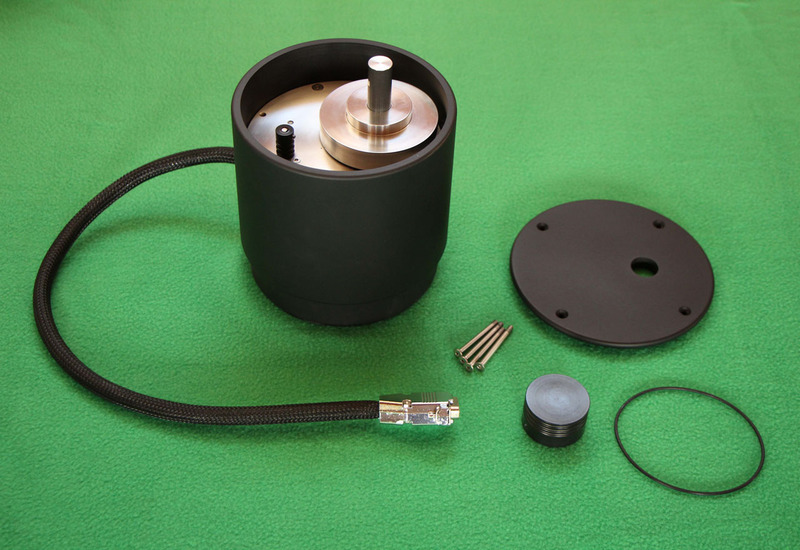 The central boss is made of brass and fits over the bearing shaft. The lower platter is steel, the middle platter aluminium, and the top platter features a Delrin construction. The stacked multi-disc platter configuration ensures effective decoupling of the top platter surface from the bearing shaft. The platter assembly’s substantial weight ensures ample inertia for absolute rotational speed stability. 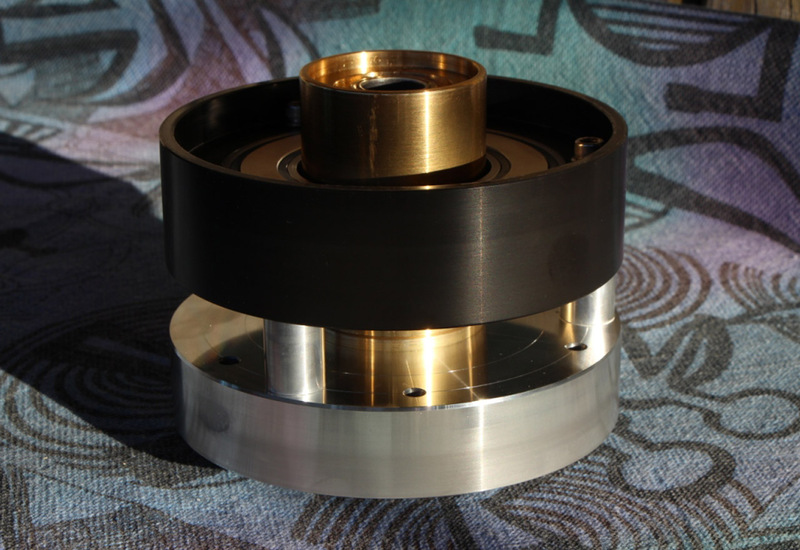 However, to limit the force of the platter on the thrust bearing, the Revolve features a magnetic levitation system employing a pair of ring magnets that create an upward force of approximately 16kg, therefore limiting the force onto the thrust bearing to just 1,5kg. The main bearing consist of a 20mm diameter stainless steel shaft in a 60mm diameter brass housing lined with polymer bushings. A reservoir filled with synthetic oil keeps the surfaces submerged and lubricated. These are only some of the technical highlights. As mentioned, every aspect of the Revolve – from the viscosity of the oil and the programmable motor controller to the make-up of the vibration-absorbent material sealed in the base of the plinth – has been carefully considered, tested and fine-tuned. Indeed, as this is the prototype, some aspects continue to be evaluated and tweaked. Given the sheer substance of the Revolve, it should come as no surprise that the packaging it comes in is equally substantive. Total system weight exceeds 100kg, and the turntable comes in a custom-made plywood box fixed to a shipping pallet. That said, the actual unpacking and set-up procedure is pretty straightforward, again underlining Dixon’s penchant for intelligent design and efficient engineering. I was fortunate to have Lance and Sonor Audio’s Roy Witelson on hand to unpack and install the Revolve in the AVSA listening room. The Revolve was set up on a sturdy four-tiered Sound Structures stand, which allowed the deck to be placed on the top tier, with the control unit directly below it. That still left space for the Valve Audio Whisper phono stage used for this review, and an IsoTek Evo3 Aquarius power conditioner to provide a consistently clean stream of AC power. Some time was spent setting up and checking the alignment of the Phantom/VdH Colibri combination using a Dr Feickert protractor, but even that process was relatively quickly completed. While the Primare PRE32 pre-amp and Parasound Halo A21 power amp were used throughout the review period, several loudspeakers were tried in the process, including our usual KEF R500 reference floorstanders and KEF LS50 bookshelf speakers, as well as B&W 702 S2 and B&W 705 S2s, Sonor Audio Clario 6.2s, and Vivid Audio V1.5s. What should be factored in here is the sheer quality of the Graham tonearm and Van Den Hul Colibri cartridge. They not only contribute well over R200k to the value of the turntable, but are major contributors to the Revolve’s stellar sonic performance. That said, remember that a tonearm and cartridge of such elevated quality would also be more than capable of exposing any flaws in the record deck’s make-up. It’s to the credit of the Revolve that the tonearm/cartridge combo sounded very much at home in this application. From the outset, I was struck by the Revolve’s ability to deliver its sonic wares with an uncanny sense of clarity and presence, linked to expansive but always cohesive staging and almost delicately rendered, pin-point focussed imaging. The music picture wasn’t just painted in bold strokes, but carefully coloured in with finely textured tonal hues. The three-dimensional realism of the delivery endowed the music with an almost tactile quality that precisely placed instruments and voices on a soundstage seemingly undeterred by the actual, physical boundaries of the listening room. The sound picture conveyed scale and ambience with exceptional clarity and purpose, adding to the powerful realism of the music’s rendition, and its ability to engage the listener. A total absence of any background noise afforded the music full, free passage, adding to the visceral intensity of the music. Also, the exceptional dynamic scope and agility of the delivery ensured that nothing buried in the record’s grooves escaped the Revolve’s attention. There was an inherent honesty and a beguiling charm to the sound that compelled extended listening, while the turntable had an astonishing ability to extract and explore microdetails and musical subtleties, adding to the immersive nature of the listening experience. Listening to the opening track of the Cowboy Junkies’ Trinity Revisited revealed a dead-quiet background that created a deep, inky backdrop against which the music was juxtaposed with a vividly powerful intensity. The haunting vocals were perfectly presented in both spatial and tonal contexts, allowing a sense of presence that was almost eerily real and believable. The instruments were presented with clarity and intent, while the banjo and acoustic guitar on the left given the starring role, even if the electric guitar’s more subtle contribution was always acknowledged. The powerful, incisive bass lines and almost delicate drumming were also revealed with an unwavering honesty and approachability that made for riveting, compelling listening. Turning to Mary Black’s Full Tide, the lucidity and engagement of the music were the key hallmarks. On ‘The Land Of Love’, the performance was spread wide and deep, with close attention paid to every element: from Black’s lyrical, emotive vocals to the layered harmonies, the powerful yet poised electric bass, and the dialogue between guitar, banjo and a mournful harmonica. Despite the relatively polite, understated mix, the sound had a light-footed ease that added to the accessibility of the music, while the generous staging allowed wide-open imaging, with plenty of air to accommodate and reveal finer nuances. Not that the turntable lacked anything in terms of impetus and intensity: it displayed a musical potency borne not only of a broad tonal range and a real talent for momentum and pace, but also the utter believability of its imaging. The layered arrangement and abundance of fine detail on ‘Your Love’ made for a sparkling, carefully rendered and yet utterly spellbinding performance, where every facet of the music was presented with such poise and balance that I didn’t want the music to end. I remain a sucker for Dire Straits, and Brothers In Arms is only one of the band’s albums on my favourites list – especially this Mobile Fidelity 45rpm version. On ‘So Far Away From Me’, the Revolve made the most of the recording’s inherent precision, creating an engaging listening experience, with the muscular bass and circumspect drumming providing a solid backbone for the guitars, swathed synths and Knopfler’s almost melancholy vocals. The table’s inherent transparency highlighted the huge, engaging soundstage that seemed completely unconnected with the point sources, and benefited the recording’s beguiling atmospherics. The Revolve revealed an uncanny ability to capture the ambience of the studio – something that few sources manage to do as precisely. Despite its power and momentum, the bass was kept in careful but unrestricting control, while there was a cohesion and an integrity to the music that further contributed to its compelling nature. The interplay between the fuzz-edged guitars and soaring synths on ‘MTV’ was spellbinding, while the percussion sounded almost too sharp, too edgy, but was never allowed to become aggressive, steering a fine line between incisive precision and impact instead. The luscious, generous performances on Sting’s Symphonicities provided a further, compelling platform for the Revolve deck’s considerable talents. The turntable had no problem doing full justice to the rich tapestry of sound that typifies this recording . On ‘When We Dance’, the orchestra’s smooth strings and soulful horns provided a smooth, shimmering backdrop to Sting and Jo Lawry’s vocals, with the voices majestically soaring over the dense orchestral backdrop. Moving on to ‘End Of The Game’, the Revolve managed to explore the momentum and muscle of the orchestra, yet never lost sight of the delicate details. The tonal balance was smooth, even rich, but never oversaturated, with the lower registers expressing an almost tactile intensity. The deck’s penchant for imaging allowed the full majesty of the orchestra to be expressed with vivid intensity. It always maintained a perfect equilibrium between the rock band and the orchestra. Thus, the drum kit’s incisive beat and the eloquent electric bass were comfortably accommodated in the broader orchestral vista created by the strings, while Sting’s polished vocals were allowed to soar freely above on ‘I Burn For You’. The emotive interplay between Sting and Lawry on ‘The Pirate’s Bride’ was powerfully expressed, with the orchestra’s full but thoughtful accompaniment providing a perfectly modulated, suitably dramatic backdrop. Again, the Revolve’s ability to nurture a full harvest of detail, while maintaining sonic and musical decorum, was impressive. It easily retained the musical and emotive context throughout, making for a thoroughly gripping and ultimately engaging listening experience. No doubt, the Revolve is a fine turntable – a top-end product that can stand its ground among the best of the genre, not only in terms of engineering integrity, attention to detail and outright build quality, but also in sheer sonic terms. So, where to from here? 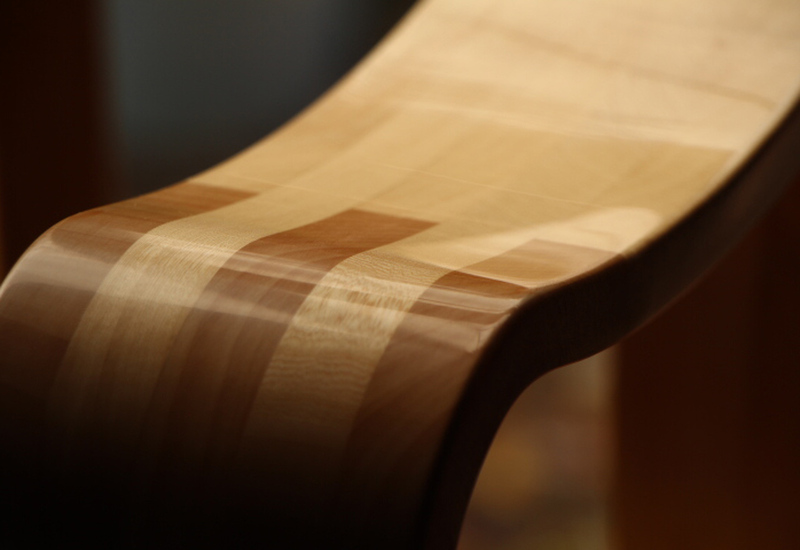 Dixon’s intentions are to produce the Revolve commercially, while offering customers an element of customisation through allowing choices as far as wood selection and finishes are concerned. 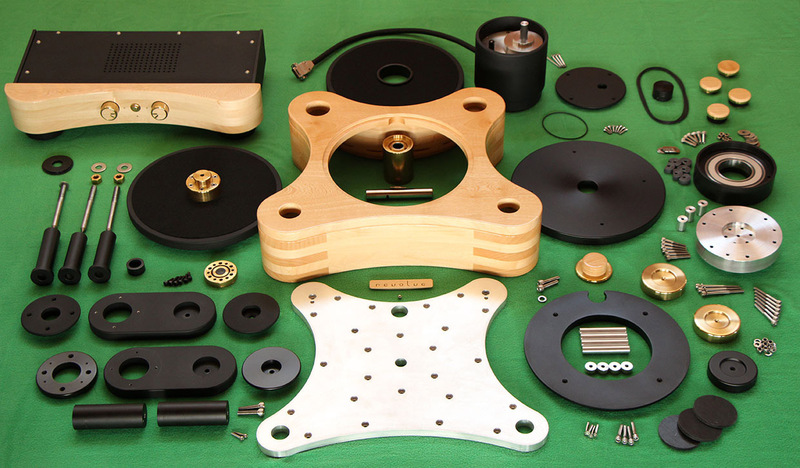 Of course, this level of manufacturing quality, linked to impressive sonic capabilities, doesn’t come cheaply, and given the very limited scope for truly high-end turntable sales in South Africa, the Revolve needs to find an international audience to succeed commercially. For Dixon, the challenge will be to overcome the significant hurdles associated with exporting such a high-tech, labour intensive and quality-critical product. It’s not easy building up sufficient stock, finding a committed distributor for foreign markets, and creating international awareness through marketing, attending shows, and earning media coverage. Even so, the Revolve is a remarkable achievement that epitomises rare perseverance, a true commitment to quality and a desire for sonic excellence. On that basis alone, the Revolve deserves to succeed.